We did this by turning to the people who actually use the services — you and other Computerworld readers. We conducted a 5-week-long online survey in the fall of 2014 asking smartphone users to rate their providers in a variety of categories: average upload speeds, average download speeds, availability of connection, reliability of connection, performance relative to cost, technical support, selection of phone models and customer service/billing. Respondents were given five choices for each category: very satisfied, satisfied, neither satisfied nor dissatisfied, dissatisfied and very dissatisfied. We tallied the results from our 652 respondents and came up with the winners and the losers — including a new leader in customer satisfaction. We asked a variety of other questions as well, such as what activities people use mobile data networks for, how much they pay for their service, why they chose their mobile provider, whether they believe their carrier protects their private data and more. 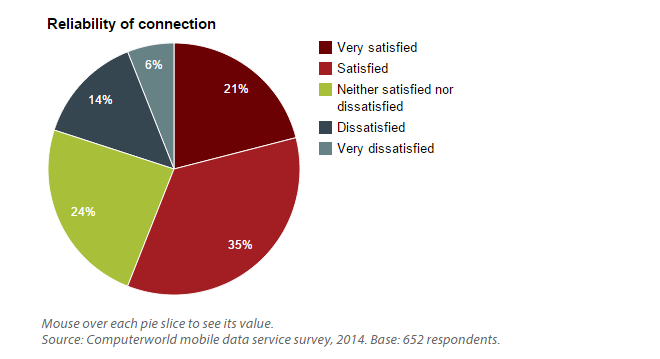 Based on the responses, we’ve put together a comprehensive snapshot of mobile data use and satisfaction. 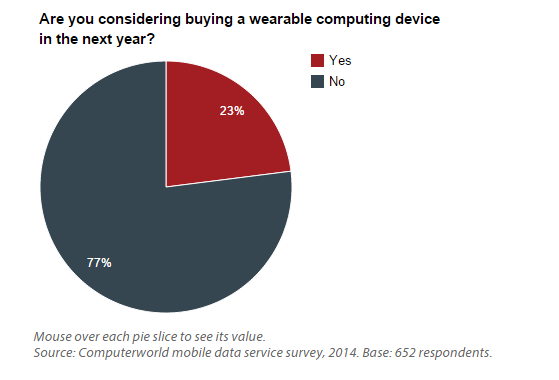 We found, for instance, that despite all the hype around smartwatches and other wearables, less than a quarter of respondents are considering buying one in the coming year. And although nearly half of respondents say they’re more concerned about mobile data privacy than they were in 2013, more than half haven’t changed their mobile habits because of those concerns. There’s a lot more we’ve found out, some of it quite surprising. Read on for all that, and to find out which mobile data provider has moved into first place for customer satisfaction in our survey. Editor’s note: For the sake of readability, in the story text below we’ve combined the “very satisfied” and “satisfied” responses into a single “satisfied” percentage, and we’ve likewise combined the “dissatisfied” and “very dissatisfied” responses into a single “dissatisfied” percentage. The accompanying charts show the full percentage breakdowns. The satisfaction numbers vary dramatically by carrier, with 69% of Verizon customers in our survey being satisfied, closely followed by AT&T’s 67%. Respondents who use Sprint are the unhappiest, with only 39% satisfied and 46% dissatisfied; in fact, in this survey Sprint is the only carrier whose customers are more dissatisfied than satisfied with the availability of their data connection. 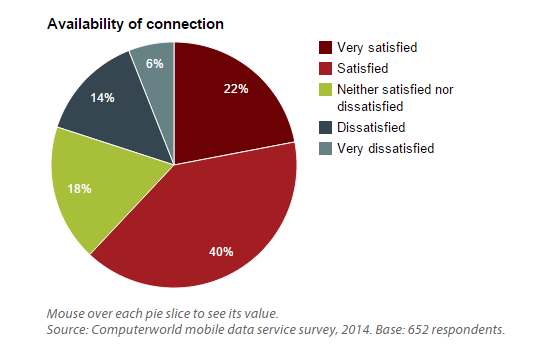 T-Mobile, meanwhile, had 54% of its customers satisfied with the availability of its data network. Similarly, in 2013 Verizon was on top and Sprint at the bottom when it came to the availability of a data connection. 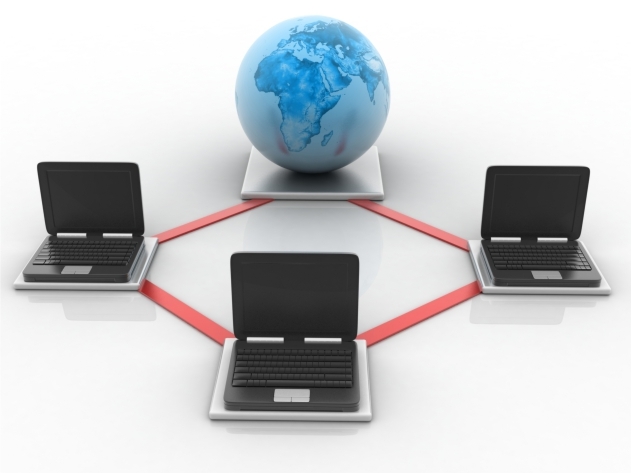 As for the reliability of a data connection once it’s made (are there dropped connections or streaming interruptions? 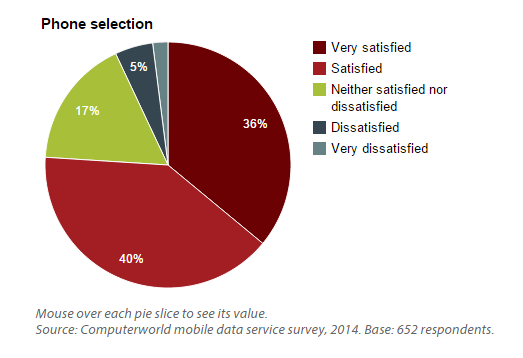 ), respondents are slightly less satisfied than with its availability, with 56% being satisfied and 20% dissatisfied. These numbers are down slightly from 2013, when 61% reported themselves as being satisfied and 18% unsatisfied. Again, the results differ according to carrier, with Verizon having the highest satisfaction rate at 59%. That’s closely followed by T-Mobile with a 58% satisfaction rate — a dramatic improvement over its 44% satisfaction rate in 2013. AT&T is just behind with a 57% satisfaction rate, and Sprint brings up the rear with a 45% satisfaction (and 39% dissatisfaction) rate. In 2013, Verizon was rated tops, and T-Mobile and Sprint rated the worst. Merely having an available and reliable connection isn’t good enough — you also want a connection that’s fast. And people are not as satisfied with the download and upload speeds of their service as they are with its availability and reliability. 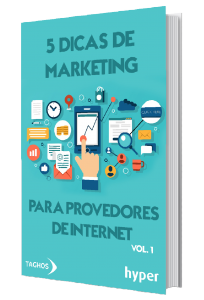 Some 59% of respondents are satisfied and 18% dissatisfied with their download speed. 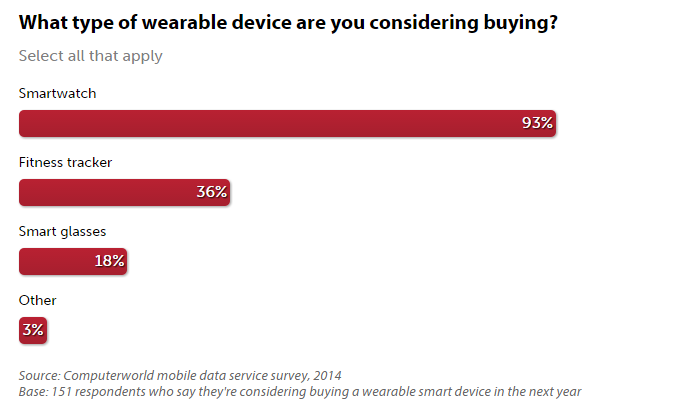 That’s below 2013’s 66% satisfaction and 16% dissatisfaction rates. T-Mobile is on top in the current survey with a 65% satisfaction rate, followed by AT&T at 62% and Verizon at 59%. Sprint is far behind with only a 43% satisfaction rate, barely beating out its 39% dissatisfaction rate. Although all four carriers’ download speed satisfaction ratings dropped somewhat year over year, the most notable drop is for Verizon, which went from first place and a 71% satisfaction rating to third place with just 59%. 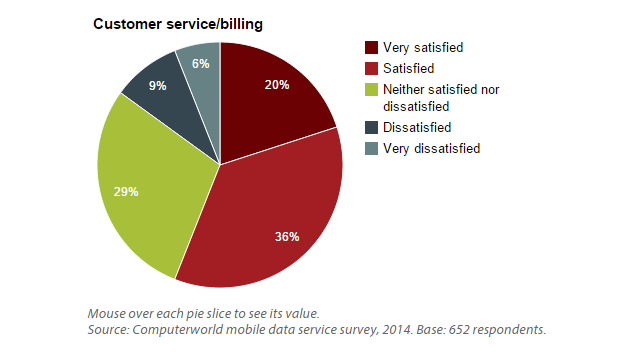 Are people pleased overall with the value they get from their mobile service providers? Not particularly. Only half of respondents say they’re satisfied with their service’s performance relative to its cost — in other words, its value — while 30% say they’re dissatisfied. In 2013, the percentages for both satisfied and dissatisfied ratings were somewhat higher: 52% said they were satisfied and 25% dissatisfied. When it comes to phone selection, though, people are quite content. Phone availability gets the highest ratings in the entire survey: 76% of people are satisfied with it, compared to only 8% who are dissatisfied. That’s down slightly from last year, when 81% of people said they were satisfied, and about 7% were dissatisfied. 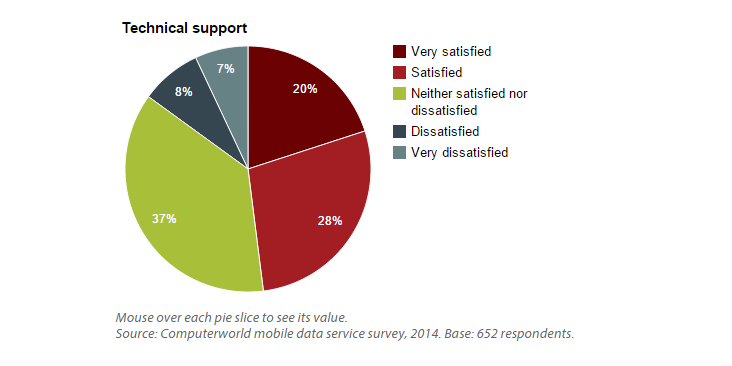 Here’s the least surprising fact you’ll find in our survey: You’re not happy with your provider’s technical support. Only 48% of respondents report themselves as satisfied, and 15% say they’re dissatisfied. This significantly worse than in 2013, when 58% of people said they were satisfied and only 9% were dissatisfied. T-Mobile is on top for the second year in a row, although it gets only a 54% satisfied rate among respondents in the current survey, down from 68% in 2013. The other three providers don’t even reach a majority of satisfied customers among our respondents: Sprint and Verizon each have 49%, and AT&T has just 43% satisfied. Given respondents’ general satisfaction with their carrier in all these areas, we weren’t surprised to find that only 39% say they’re considering switching to another provider. The most common reason given for considering a change is price, followed by coverage/reliability, plan options and customer service. But once again the results vary considerably among different providers’ customers: While just 28% of respondents who use T-Mobile are considering switching, more than half (51%) of Sprint customers in our survey say they’re considering it. The other carriers fall in between, with 33% of respondents who use AT&T considering switching and 44% of respondents who use Verizon considering it. Price is the No. 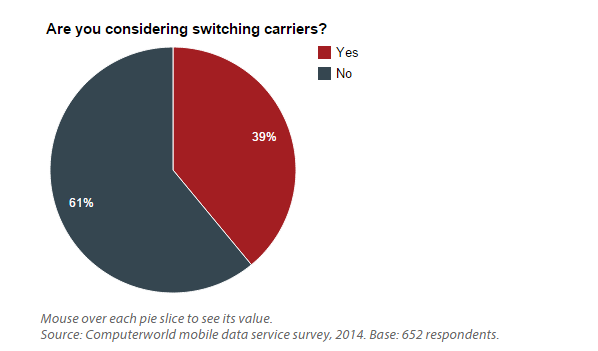 1 reason named by Verizon and AT&T users in our survey considering a switch, while respondents who use Sprint and T-Mobile cite coverage/reliability as the primary reason. Sixty-three percent of respondents say their carriers are trustworthy when it comes to protecting their privacy, compared to 22% who believe they are untrustworthy. T-Mobile’s customers rate that carrier the highest, with 76% saying it is trustworthy and only 14% rating it as untrustworthy. There was no real difference among the customers of other carriers, which each had either 61% or 62% trustworthiness ratings. Overall, 48% of respondents say they are more worried about the privacy of their mobile data than they were the previous year, 46% say their privacy fears haven’t changed and 6% say they worry less. Among respondents’ top privacy concerns are government snooping, ever-more sophisticated hackers and an increase in large data breaches. Slightly more than half of respondents (53%) say they haven’t changed the way they use mobile apps or mobile data in the past year due to privacy concerns, while the remaining 47% say they have changed their data behavior because of privacy fears. Those who have made changes cite a variety of safety measures taken, including using stronger passcodes or two-factor authentication, using a VPN, installing fewer apps, limiting apps’ permissions (such as accessing location data), encrypting data, and simply not using a phone for conducting transactions such as banking, shopping or accessing medical data. People seem to be quite cognizant about not spending too much time on their data connections, possibly because most are on tiered data plans rather than unlimited plans. 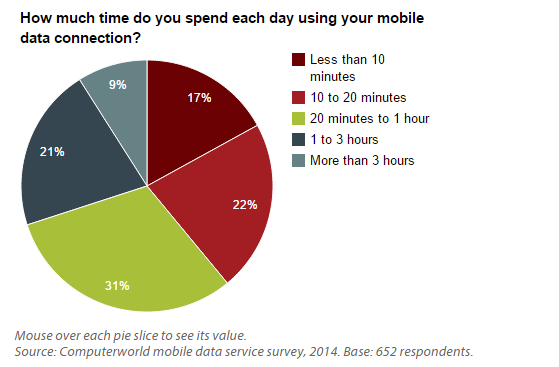 Only 30% say they use their data connection for more than an hour a day — 21% use it for between one and three hours, and 9% use it for more than three hours. (Note that these numbers don’t include the amount of time they use Wi-Fi connections.) Thirty-one percent of people use their data connection for between 20 minutes and an hour per day, 22% use it for between 10 to 20 minutes, and 17% use it for less than 10 minutes. All these numbers are generally in keeping with what we found in 2013. 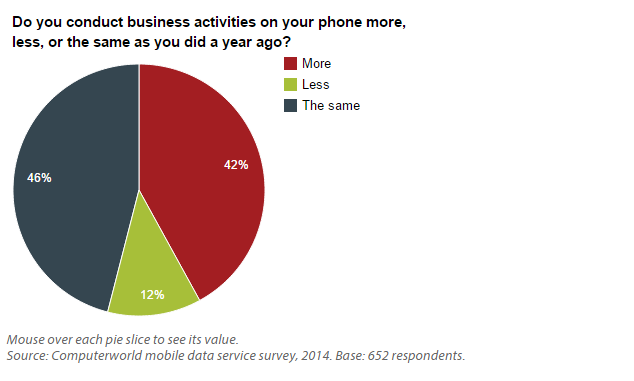 Some 42% of respondents report that they’re using their phones more for business than the previous year, for activities such as checking work email, using productivity apps and accessing data in the cloud. Only 12% say they’re using their phones for work less. The remainder say business use has been unchanged. 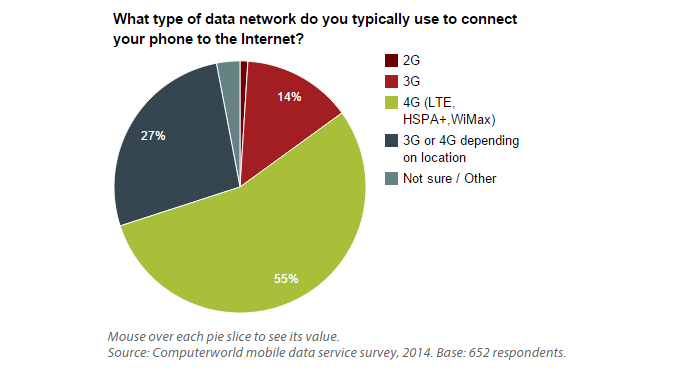 There is little difference in these numbers among people who use different carriers.